Somewhere between the boring conventional SUVs and the expensive luxury SUVs sits an option for drivers who want more for less. Volkswagen knows a thing or two about premium features, and that’s seen front and center with the 2019 Volkswagen Tiguan. Combining utility with interior comfort and convenience, this is a stellar option for compact SUV shoppers. 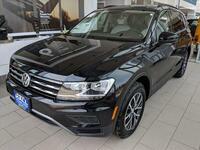 Check it out here at Hall Volkswagen near Milwaukee WI! The best Tiguan yet is here and now for 2019. It comes in six different trim levels (S, SE, SEL, SEL R-Line, SEL Premium, and SEL Premium R-Line) which means there are plenty of options to choose from. Whether you prioritize performance, technology, or active safety features, you’ll surely find a model that suits you and your budget well. The 2019 Tiguan comes equipped with a powerful yet efficient 2.0L TSI® 4-cylinder engine under the hood, which powers the SUV with 184 horsepower and 221 lb-ft of torque. Efficiency is enhanced by the eight-speed automatic transmission for seamless gear changes and a smooth overall ride. We all know how slippery these Wisconsin roads can get in the winter, but that shouldn’t be a problem when you take advantage of the available 4Motion® Active Control All-Wheel Drive feature for optimal traction and stability. When it comes to utility, the 2019 Tiguan comes to the plate ready to play. With the rear seats folded down, you’ll have up to 73.5 cubic feet of cargo space to work with. Drivers and passengers alike will experience a wealth of comfort and convenience features such as a panoramic sunroof, V-Tex leatherette seating, and a hands-free Easy Open and Easy Close Liftgate. The Tiguan doesn’t fall short in the technology sector either, as it comes with standard and available features like the Volkswagen Digital Cockpit, Fender® Premium Audio System, 8-inch touchscreen navigation system, Overhead View Camera, and much more. There’s no question that the Tiguan is one of the top compact SUVs for 2019 among other competitors. Are you ready to experience driving in a whole new light? Come check it out here at Hall Volkswagen near Milwaukee and schedule a test drive here on our website!